Green Manuring: How Nature Feeds Herself! 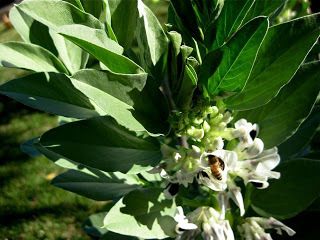 I was pulling the last of my broad bean crop when I was reminded of the dual nature of plants like this – while it had been feeding me and my family, it had also been feeding the soil! 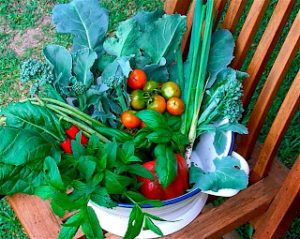 WHAT: Green manures are a cornerstone of ecologically sustainable gardening. These are annual fast growing crops, usually a legume combined with a grass, that are grown to build both organic matter and nitrogen levels to improve the soil. HOW: Broad beans are part of the large pea/bean family – legumes, and they have the ability to ‘fix’ nitrogen from the air onto their roots. I’m going to get technical here, so bear with me. Plants such as clover, lucerne, peas and beans have an important advantage over other plants – they able to obtain nitrogen, a major element needed for plant growth, from the soil air. They do this by forming a symbiotic relationship with a group of bacteria called rhizobium, which live within a specialised structure, called a nodule, on the plant’s roots. 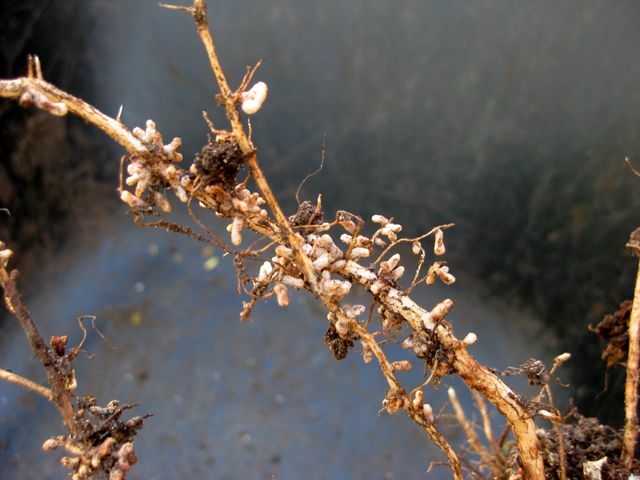 The rhizobia can take nitrogen (N2) from the air and convert it to ammonium (NH4), the form of nitrogen plants normally obtain from the soil. This process is called nitrogen fixation. And this was all going on while you were having a cup of tea! Nitrogen nodules on the roots of my broad beans. FACT: Although I dozed off in most of my history classes, I do remember the teacher talking about mediaeval ‘strip rotation’ where a field was left ‘fallow; every third or fourth year and a green manure was planted to revitalize the soil. Not only does the soil get a nitrogen burst, but it adds valuable organic matter as the spent plants rot down. This is what farmers used to do before the advent of chemical fertilizers. Green manuring can be done with lots of leguminous plants that can be bought in bulk from seed suppliers – like cow-pea, vetch, alfalfa, clover, lucerne and lupins. 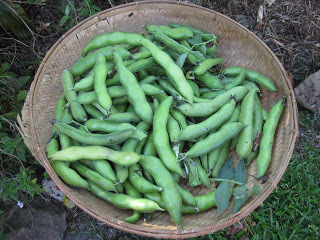 The Greeks actually did it two thousand years ago with broad beans. NOTE: It’s a good tip to mix your green manure seed with a cereal grass like sourghum, millet, barley and oats – not invasive couch or kikuyu please! WHY: The cereal grasses help to break pathogen cycles in the soil, suppress weeds and provide bulk carbon for decomposition with the nitrogen rich legume plants. ( If you know about effective composting you know why this is important). WHEN: My daughter has just launched into the daunting task of trying to landscape her garden. Half an acre of weeds have just been bulldozed which has left the earth bare. 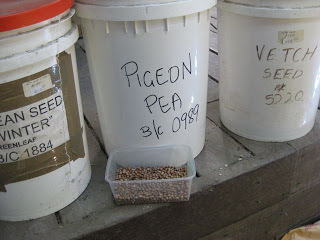 The very best thing to do now is plant a green manure crop – we have pigeon-pea, sorghum and lupin – we were just waiting for some rain (yeeh, 43 mm last night!) Initially this will ensure a living mulch over the soil to suppress weeds growth. Then, just before the plants reach maturity we will slash them and let them break down into the soil. 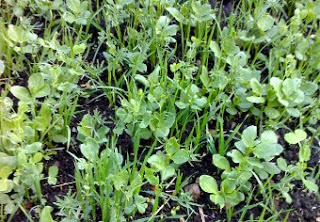 Don’t be tempted to cut the green manure too soon! Use this method wherever you have a bare patch of ground that you want to be productive. I am in awe of the ingenuity of Nature and her ability to regenerate – in spite of our meddling and damaging ways! One of the joys of living in Sydney was being surrounded by three wonderful National Parks (Royal, Blue Mountains and Kuringai) and going for walks in them, particularly in the springtime. It was here I cut my ‘horticultural teeth’. 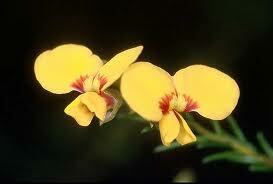 With increased knowledge, I began to notice that the leguminous plants performed a particular function – the short-lived acacias(wattles) behaved as pioneers, colonizing forest edges – enriching the soil for the seedlings of longer lived plants – like eucalypts (gum trees), and the tiny yellow pea plants on impoverished soils (eg. Bossiaea and Dillwynia) disappeared once the soils improved. What they were each doing, in their own way, was enriching the soil with nitrogen – playing a vital role in their ecosystem. So.. Green manuring is just a simple way of capturing Nature’s knowledge and harnessing it for a simple, cheap and effective way to organically enrich your soil.